Daniela De Marco at Fraser Yachts tells me that the stunning 49.91m Picchiotti Exuma, to which Boat International was given exclusive access this summer, is available for charter over the coming months as she continues her world tour. She will be available around the Fijian islands from 18 September until mid or late October, when she will travel to New Zealand and cruise there until March. In this location she could represent a great opportunity for rugby fans during the World Cup in New Zealand (9 September – 23 October). If she secures bookings before then, however, she could be available until Christmas or New Year either in Fiji, Tonga or New Caledonia. Exuma’s shallow draft allows her to cruise close to the coastline and her array of water toys include an amphibious jeep and a hovercraft. The Philippe Briand design is the first motor yacht in the Vitruvius series built by the Perini Navi Group. The Vitruvian yachts are designed to create less drag than a conventional displacement hull, consume less fuel and therefore emit relatively low quantities of CO2. 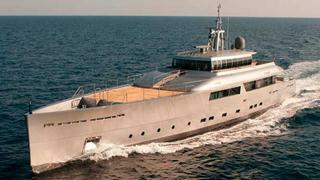 The Italian classification society RINA named Exuma ‘Green Yacht of 2010’. She was voted 'Motor Yacht of the Year' alongside Eclipse at the World Superyacht Awards in May, and featured in the October 2010 issue of Boat International.